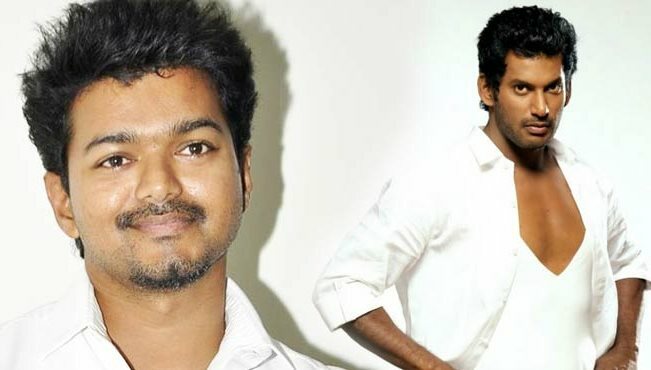 Vishal wants to direct Ilayathalapathy Vijay! Actor Vishal recently appeared for an interview in a television channel and answered the questions of his fans over the phone. Home » Paayum Puli | Puli | Vijay | Vishal » Vishal wants to direct Ilayathalapathy Vijay! Interestingly he pitched in a lot for his forthcoming release Payum Puli. The movie directed by Suseenthiran has Kajal Agarwal as heroine and would be released 4 September. Says Vishal, 'I started my career as assistant director. Though I am actor today, if given an opportunity would love to direct actor Vijay'. Worth to recall that, it was earlier rumoured that Vijay and Vishal are in the midst of a cold war of sorts. Later pressmen quizzed Vishal about his alleged opposition of Illayathalapathy Vijay, the ‘Paayum Puli’ actor sealed it with just a few words saying that he himself is a diehard fan of Vijay. Basing on this some miscreants have illegally published a tweet from Vishal’s account which stated that Vishal felt that Sivaji Ganesan is not dead and is living through Vijay, which caused a huge buzz in the social media circles.